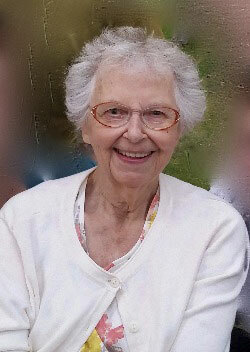 MARQUETTE — Rita Marie Calcaterra, 83, went home to be with her Lord on Feb. 23, 2017, at Mill Creek Memory Care Facility — in the loving and gentle care of her family, dear friend Geri Nault, and caring staff of Lake Superior Hospice and Mill Creek Memory Care. Rita, daughter of Roy and Libby LaPean, grew up in Iron Mountain. She, with her twin brother Roy, spent their years in Iron Mountain surrounded by close family and good friends. She fell in love with John (Jack) Calcaterra of Norway after a blind date and they were married July 11, 1953. Their lives were blessed with six children: Mary (Dennis) Maki of Marquette, John (Barbara) Calcaterra of Cloquet, Minn., Julie (John) Finnbraaten of Rome, Wis., Ann (Scott) Neubauer of Jordan, Minn., Joe (Dianne) Calcaterra of Neenah, Wis., and Catherine (Rob) Hardenbergh of Marquette; 16 grandchildren and 14 great-grandchildren. She had worked at Grede in Kingsford when she was first married, then as a baker at Tony’s Country Kitchen in Calumet, and finally as a “lunch lady” for the Iron Mountain Schools. For Rita, the joy of her life was her family and caring for them. Love was lavished on those she loved with homemade bread, sweets, jellies and a listening ear. She loved to play cards and would often times skunk her family in a good game of cribbage. Later in life, Rita learned how to play golf and she and Jack would spend much of their time on the greens of Oak Crest Golf Course in Norway. The peacefulness, beauty, and competitive nature of the game spoke to her and became a hobby that she truly enjoyed. Not to mention, the close friendships which were shared. Rita and Jack moved to Marquette in 2014 to be closer to their two daughters as their health began to decline. For Rita, living close to two of her children was a dream come true. She lost her love Jack after 64 years in 2015. As lost as she was without Jack, and even though her eye sight and health were failing, she did not complain and always was thankful for all she had. Her selflessness and her faith kept her focused on the gifts in her life which allowed her to accept her declining health with grace. Her faith was quite simple, yet she lived out her faith even during the most difficult of times. Her love for God was evident and her faith was persevering. She was a true servant, a child of God, and an instrument of peace. The family will receive relatives and friends at St. Michael Catholic Church in Marquette on Monday, Feb. 27, at 3:30 p.m. (Eastern time). A Mass of Christian burial will be celebrated at 5:30 p.m. Monday with Rev. Greg Heikkala as celebrant. In lieu of flowers, memorials may be directed to Cross International and Lake Superior Hospice. The Fassbender Funeral Home of Marquette is serving the family, where condolences may be expressed online at fassbenderfuneralhome.com.